Don’t take my word for it….aggression, reactivity, fearfulness, anxiety oh my! Private training: too much dog! If you are looking for an outstanding trainer I cannot overstate how much I recommend Lynne. I have had many dogs over the years and for the most part have done a suitable enough job. 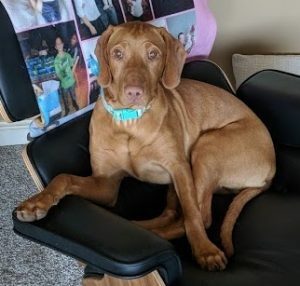 Then we got a Vizsla/Lab mix who is literally the most high energy dog I have ever had! I admitted I was over my head at about 6 months and found Lynne after an exhaustive search. In addition to Bu’s boundless energy, she is also a very nervous/skittish dog. Lynne is extremely observant and doesn’t take a one-size fits all approach. She assesses the individual need of the animal and then tailors a program to fit their specific needs. I know this because I pulled her to also help with my daughter’s min pin that can be quite aggressive with visitors and is quite the barker. 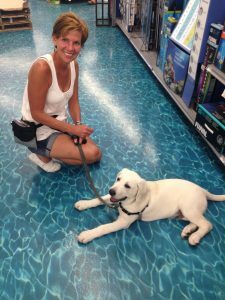 Lynne has not only helped train Bu to where I can calmly walk her through stores, but she also helped me be a better owner and taught me to understand the behaviors of our pets and how to get the responses that we are looking for. 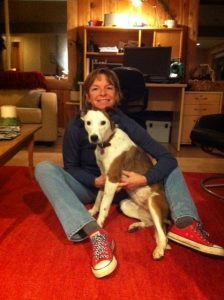 Rest assured Lynne will help your dog be the best they can be and help you be the best owner you can be. 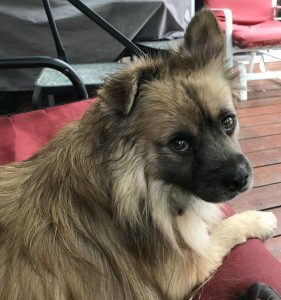 In August, 2017, we adopted Friederik, a Keeshond-Pomeranian mix. He was about 4 years old when we got him and had been living on the streets. We’d been told that he was housebroken, which was definitely not the case. Friederik was our seventh dog and we’d never really had any trouble housebreaking a dog before. But after eleven months of trying everything, we were still finding pee on the floor several times a week. All of the books and websites and message boards we read said exactly the same thing, and nothing was working. To say we were getting desperate is an understatement. My vet recommended that we try Lynne. The improvement has been positively overwhelming! Lynne picked up on little things that made all the difference in the world. 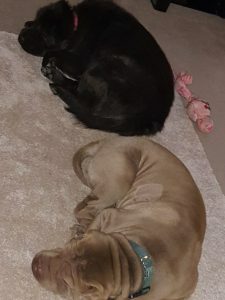 What might have worked for most dogs wasn’t working for Friederik and Lynne helped us to refine our training methods in such a way that there was an almost immediately improvement. I can’t recommend her highly enough! Thank you for your expert guidance. Sparky and I appreciate your guidance and role modeling what “good” looks like. We had a great walk just now with lots of people out and no incidents. Today Sparky and I went on our usual 1.8 mile route at 6 a.m., and I had many opportunities to practice the training tips. We encountered 8 dogs, and I only needed to use the management strategy with two of them. Even at that, he only barked a couple of times. With the other 6 dogs, I caught Sparky in time to give the sit command (he did each time), to give him a treat that I placed in front of my face before tossing it on the ground. I backed up a few steps and repeated the drill. I was so proud of him. Thank you for helping all of us. Today’s success is very exciting! 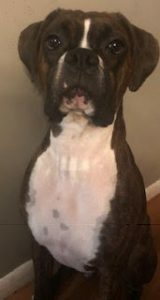 Bo a 2-year-old male boxer presented with redirected aggression (fighting) with three other family dogs. He also presented with reactivity (growling, barking and lunging) towards dogs when on-leash and through the yard fence. Lynne, I’ve been meaning to tell you that max is doing really great getting in the car — as long as I ask him to get in on the passenger side. Thank you so much for your help. It’s made a major difference in our lives. I never would have thought to change the door he gets in through. Thank you!! We rescued a male Sharpei from a city shelter. He had an unknown history and a large part of his life was on the street. This presented aggressive behavior issues with our other, female Sharpei and the rescued male attacked our female. Dr. Lynne was recommended by our veterinarian. She has spent two, four hour sessions with us and she has completely re-wired the male Sharpei brain. It took work and consistency on our part, but I feel the work was all down the absolutely correct path. Thank you, thank you, Dr. Lynne. She was great! She did start to jump in the mornings or when we would arrive home. Overall, I love the progress. Thanks for all that you are doing with Celia. She is such a great dog! Rover and I can not thank you enough for teaching us how to be well mannered, obedient and trainable all while having fun and allowing puppy antics! Your positive approach helped us to be successful and all of your knowledge is incredible. We appreciate you immensely and hope to make you proud! I found Dr. Lynne easy to work with and very practical despite her depth of technical knowledge. Her training methods are ethical and founded in scientific research. This was very important to me in selecting a behaviorist that was knowledgeable to identify and address the root causes of my dog’s behavioral problems without causing additional issues or trauma. I only wish I had worked with her sooner so I had more time before moving out of state. When we introduced a new puppy to our house Lynne’s training and insight were invaluable. 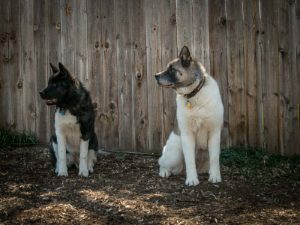 With her guidance our two female Akitas learned to share, play and live together, which appeared impossible when they first met. 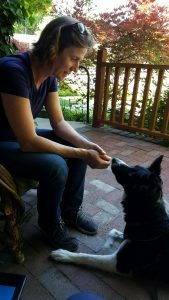 Lynne has a unique combination of critical thinking abilities acquired through her training as an animal behavior research scientist; balanced with a compassionate understanding of individual animal needs. 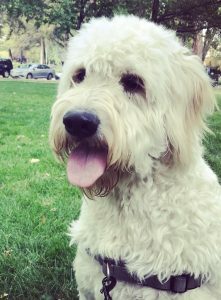 Her diverse academic, professional, and personal experiences make her particularly well equipped to develop individual and/or family-specific strategies to promote positive human-pet relationships. I have and will continue to recommend Lynne to anyone looking for an animal behavior expert to guide them toward building a more harmonious and healthy relationship with their pet. We were blown away by the detailed and thorough plan that Lynne devised for us to counteract Lola’s severe noise phobia and anxiety. Lynne developed novel ideas that we had not read about anywhere else, nor had been instructed by other animal behavior consultants that we worked with in the past. 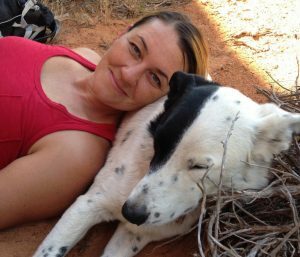 She taught us how the mind of our dog really works, and what thought processes are occurring during a noise phobia episode. Using Lynne’s behavioral tricks – such as making the loud noise appear to be the best thing in the world – has really helped Lola get through the episodes in a much less destructive way. Lola’s progress thus far is very promising and by implementing Lynne’s well thought-out plan, we are hopeful that we can get Lola to the point where she can self-manage loud noises in the future. Lynne was great to work with, and we highly recommend her for any of your pet’s behavioral needs. The advantage of working with Lynne is that she knows how to think like a dog, and can therefore offer very good advice when it comes to understanding why your pooch is exhibiting such behaviors, whatever they are…Thanks to Lynne’s natural way with dogs, complimented by her extensive research on the subject matter, I am a happy ‘new dog owner’, and even considering a playmate for Milly. Her input and assistance has been invaluable, and has changed my whole attitude about owning a puppy. 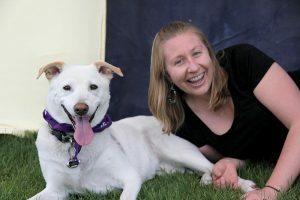 We had no doubts about who we wanted for the pet behaviorist for Dog Olympics, an annual fundraiser for the Humane Society and Four Paws; a non-profit animal shelter in Logan Utah. Lynne was our only choice – no one else had the combination of such a high professional level of learning theory and animal behavior expertise, with the icing of her dry English wit. Who else would you want to talk to about your pet’s deepest behavioral and training issues? Lynne gave us tips on more creative ways of giving Ruby, our pit bull mix, more physical and mental exercise that not only keep her distracted from problematic behaviors such as her aggression, but also strengthen her bond to us and increase her obedience to our commands. Lynne showed us effective ways of socializing Ruby to new dogs and to new people. Overall, Lynne impressed us because she was able to identify and provide solutions to several underlying issues we never realized were most likely triggering Ruby’s aggressive behavior. 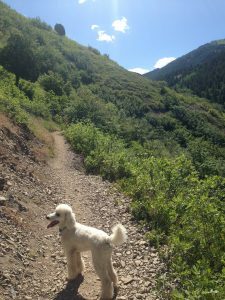 It seemed that Lynne’s solid understanding of canine behavior, as well as her humble personality, helped her provide honest and intelligent insight into our dog’s behavioral issues, and create helpful solutions. She did not pretend to quickly treat a problem with a Band-Aid formula, but rather sought to understand and evaluate Ruby’s behavior and help us, as owners, understand the best way to train her. We were very pleased with Lynne’s professionalism, knowledge, and gentle demeanor when helping us address our dog’s behavioral issue of jumping up on guests and strangers. 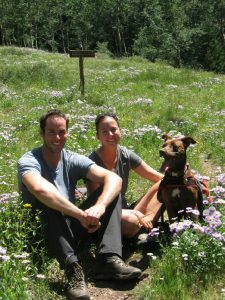 She helped us to not only understand why our pup was doing what he was doing, but also gave us a step-by-step plan for how we could work to change that behavior. 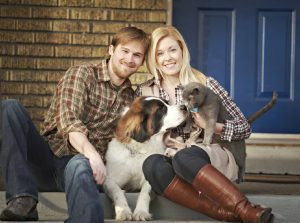 We’d easily recommend her to anyone who is looking for an animal behaviorist who works with you, your family, and your furry friend to make changes in a positive and productive way. How could I improve the consultation experience for clients? How could I improve the usefulness of the behavioral plan? Any additional feedback that could help improve my service to clients and their dogs?